What Are Bike Pegs For? Pegs are not common on most forms of bicycles. In fact, for many types of bikes, they would only serve as useless weight or an obstacle to deal with. These pegs are usually fixed to the rear axle and front wheel of your bike. Pegs are used primarily to perform stunts and tricks on motocross bicycles. On BMX bikes pegs vastly expand the types of tricks possible, from front wheelies to double peg grinds. Bike pegs are designed for riders to place their feet and their weight over the center of the wheel. This provides a more stable platform than the pedals, allowing the rider more control in the movements of the bike. The positioning of the axles makes balancing on one wheel much easier and provides a pivot point to rotate and move the BMX bike. The pegs are often used to "grind" along a surface, such as a curb, concrete bench or rail, as the rider balances on the moving bike. Although some BMX bike pegs are free-spinning on the axle, most are rigid and fixed to reduce the risk of slipping during tricks. They may have metal or rubber surfaces, depending on the grip desires of the rider, and some also feature flatter tops to help the shoe grip the peg. The width can vary depending on the needs of the rider, including the space needed for foot placement and the demands of various tricks to be performed. Fans of grinding tricks usually prefer all metal pegs. BMX bike pegs can be styled as the rider desires -- they may be painted or have no covering over the metal. To some degree, the type of paint or decor used on bike pegs can change how they respond under the foot. The structural components of the pegs are too integral to performance to be selected based on style, minimizing the creative liberties afforded by this feature. Not all BMX bikes come with pegs pre-fixed onto the bicycle. 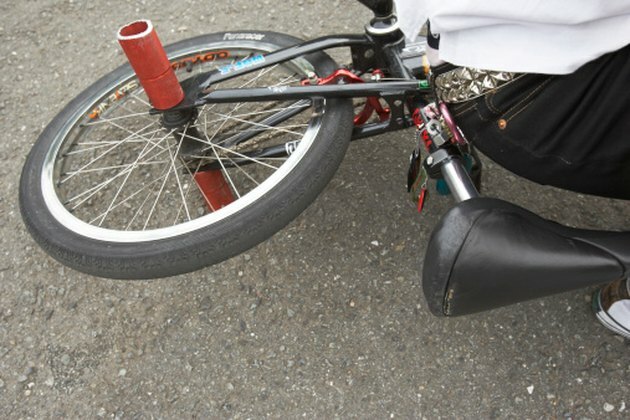 This is done to allow the owner of the bike to choose his own pegs, since the feel and performance of pegs can be very important to performing tricks. Additionally, BMX bikes designed for racing do not include pegs because this feature is useless in racing and only serves to weigh the bicycle down. Any bike intended for stunts, however, needs pegs. While pegs are optional, all freestyle and stunt riders should use a helmet and elbow pads to protect themselves when they fall.